Remote and branch offices are challenged by limited operations, the need for specialized on-site IT personnel, and the space and resources typically required to address the complexity of legacy data center infrastructure. Pivot3 offers a more efficient, cost effective solution for IT infrastructure in a Remote and Branch Office setting that reduces CAPEX and OPEX and enhances the continuity of business operations. Our software-defined hyperconverged platforms are specifically designed to consolidate server and storage resources so you can build a robust infrastructure that easily scales to meet IT budgets for remote locations. 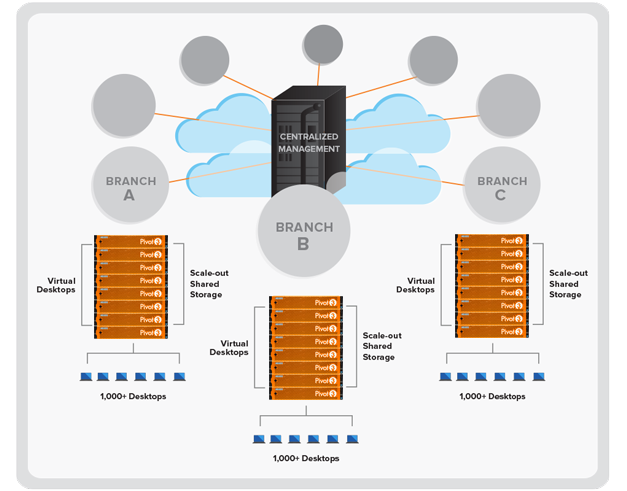 Flexible infrastructure – Improve branch services at lower costs and better resiliency than traditional solutions. Simple Scalability – Dynamic and granular scaling to easily respond to growth requirements one node at a time. Reduced TCO – With fewer requirements for space, power, networking, and cooling costs. Business Continuity – Designed for high fault tolerance and high availability to ensure uninterrupted operations. Effortless Operations – Centralized IT management for multiple locations, with easy-to-use, out of the box deployment. High Performance – Proactive diagnostics maintain high-performance for around-the-clock operations. Local backups leverage instant VM restore functions. With on premise hyperconverged infrastructure, critical operations can be restored in under an hour. Centralize IT management with an easy-to-use platform for all locations and pay-as-you-grow linear scalability to match specific resource requirements. From all-flash to hybrid, blades and more, consolidate servers and storage with our range of software-defined hyperconverged appliances. Extremely low CPU overhead leaves more processing power to run local applications and virtual desktops.